Abby Update - A Vision of Healing! 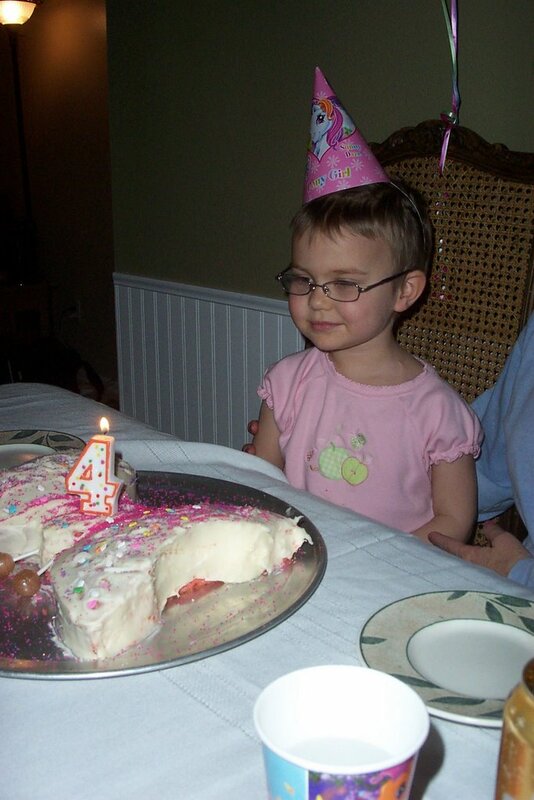 : Abby's turning 4 and is getting some more tests. Abby's turning 4 and is getting some more tests. So Abby is turning 4 today! Yippee! Crazy too. 1 year ago I was in the hospital for her day 28 bone marrow test. Also a year ago on her birthday, her cheeks looked like big fat balloons, cute but big! And last year she almost fell asleep on her birthday cake! But not this year! Nope, this year we had a terrific party! On Saturday she went out to tea with Tifffany and her mom and then we all went out to dinner that night. She even had a big bowl of ice cream after dinner. She did end up throwing that up later in the night but lets not talk about that right now. On Sunday, we had an early party for her with a butterfly cake that she helped make and decorate. Overall it was a great little family party and she had a blast. She got a couple presents and some very nice cards and was happy as a clam for the night. Now since Abby is so special, she is going to get a couple more presents this year for her birthday... one will be a CAT scan tomorrow, and the other will be a gastroscopic survey. Wohoooeee! I mean what other 4 year olds do you know that get to utilize such amazing technology so early in thier life! Pretty special indeed! Anyway, Abby will be getting a scan tomorrow to check out her sinuses since she just doesn't seem like herself lately. Immunocompromised kids often can have a sinus infection but not show the symptoms since they have such a low immunity. She will also meet with the gastro intestinal doctor to get things ready for a gastroscopic survey in the near future to check for ulcers and/or whatever else may be going on with her tummy. They will have to put her under for that procedure so we'll just be talking to the doctor tomorrow and setting up a time for the procedure. So, what do you think? Pretty cool presents huh!? Actually, I think it will be very helpful to kind of get to the bottom of some of these things that have been making Abby feel so bad. Pray that they can get some answers so she can start to feel better. You are in our prayers always!! Don't forget.... she got a Furby too!